Highly connected business people got protection from the police: Booysen - SABC News - Breaking news, special reports, world, business, sport coverage of all South African current events. Africa's news leader. Johan Booysens is the second witness to expose corruption in law enforcement agencies. Former KwaZulu-Natal Hawks boss, Johan Booysen, says highly connected business people got protection from the highest echelons of the police service. Maladministration within law enforcement agencies are still under scrutiny at the State Capture Commission of inquiry. Booysen related a story on how KwaZulu-Natal police Commissioner, Mmamonnye Ngobeni, interfered when businessman Toshan Panday was under police investigation in 2010. The former KZN Hawks boss is the second witness to expose corruption in law enforcement agencies. 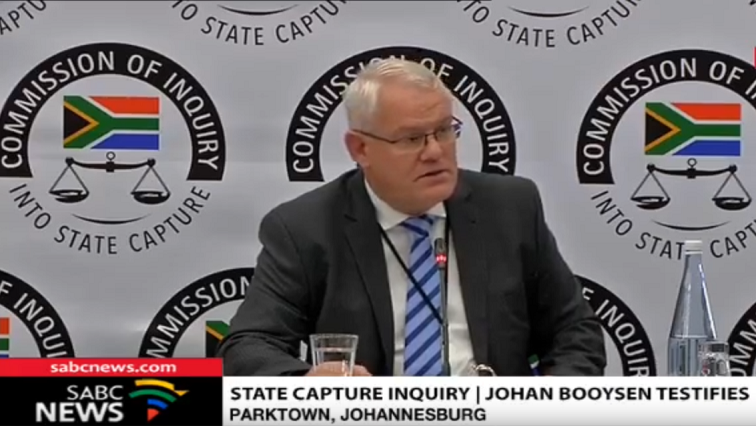 Booysen alleges that Ngobeni instructed him to stop the investigation of the politically connected businessman from KwaZulu-Natal. His testimony follows former Independent Police Investigative Directorate (IPID) head, Robert McBride’s testimony. Booysen was arrested in 2012 and accused of heading the so-called Cato Manor death squad who was accused of murdering 45 people. This entry was posted on 17 Apr 2019,05:16PM at 5:16 PM and is filed under South Africa, Homepage Featured Story Slider. You can follow any responses to this entry through the RSS 2.0 feed. Both comments and pings are currently closed.